Hi friends! 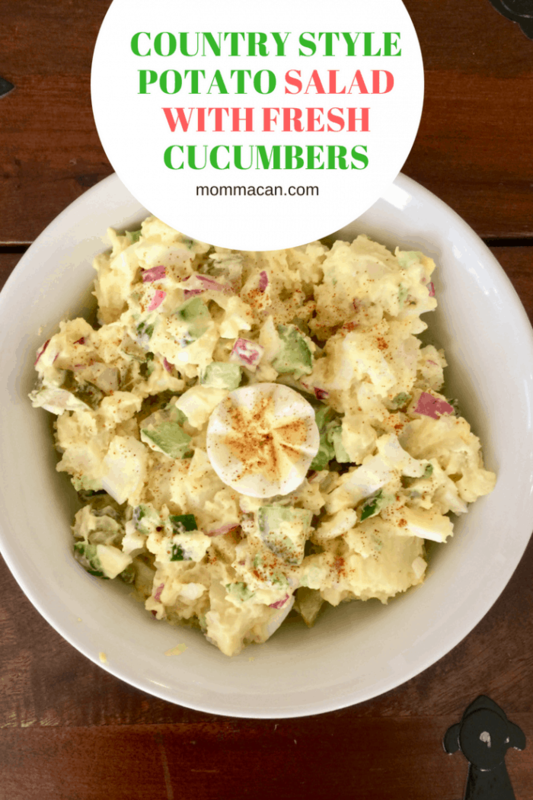 Today I am sharing my recipe for Country Style Potato Salad with Fresh Cucumbers. Summer is filled with wonderful adventures including belly flops into the pool, leap-frog in the garden and dripping chocolate cones. I can’t remember a summer in my youth that did not involve a big BBQ at my Granny Vega’s with several aunts cooking up wonderful dishes and uncles working the grill for dozens to feed nieces and nephews while listening to my granny give instructions to all of them. And let me tell you, they learned from the best. My granny was one of the most talented self-taught cooks (chefs) I have ever known. She had no need for a book-shelf full of cookbooks or a Kindle filled to the brim with instructions from Betty Crocker, she cooked with a natural sense of taste and texture and most importantly from the heart. It was fantastic! I would like to think my instinct for tossing together a good meal came from her and that my family and friends enjoy the adventure of Momma’s cooking as much as I loved my granny’s. Here is the recipe, don’t be bashful, if you love potato salad double the recipe! Enjoy! 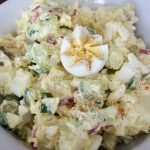 Country Style Potato Salad with Fresh Cucumbers is a yummy dish for any celebration. The crunchy fresh cucumber makes the dish light and refreshing. Add 4 quarts of water to a 6-quart pot and bring to a rolling boil over high heat. Add potatoes and salt and cook until potatoes are tender when pierced with a fork. Drain potatoes well in a colander and return them to the hot pan for a minute to dry out excess water. Place the potatoes, eggs, celery, onion, pickles, and cucumber into a large mixing bowl. Add salt and pepper to taste gentle folding to keep potato pieces bite-sized.. This salad is perfect for your 4th of July Celebration or any occasion. I would make the recipe ahead that morning to serve at lunch or dinner to get the flavors well-infused before serving. If you love this recipe, you will also love our Amish Macaroni Salad! Wow, your potato salad looks fantastic!! I have never heard of using cucumbers in potato salad before, but I can only imagine the wonderful crunch they add. This looks awesome, Pam! Potato salad is one of those weird meals where I can throw on ingredients I normally don’t like (pickles, cucumber) but together, it tastes fantastic. Thanks for sharing this! oh my goodness, my granny did raise chickens but I never witnessed the harvest, so to speak. Persian cucumbers are in most markets, it is the small ones, about length of your hand and they are usually in a plastic clamshell for protection. This looks incredible! Pinned to share! Thank you for sharing your recipe. This sounds so good! 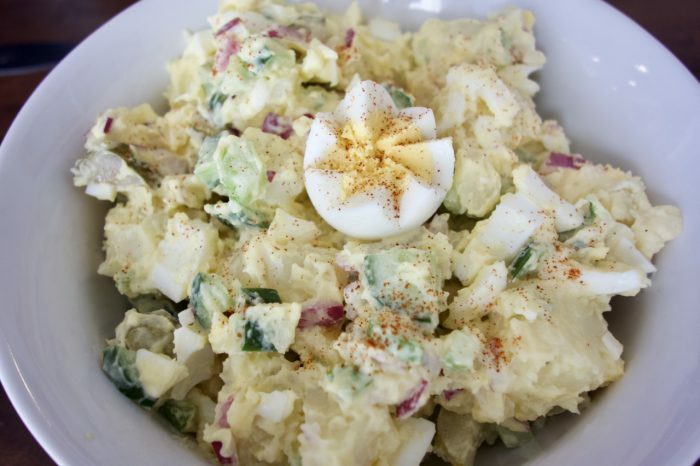 Have never added cucumbers to my potato salad, but your recipe is a must try! Thanks for linking up with Funtastic Friday!